I love being vegan. The lifestyle is in alignment with my belief system. I can walk in this world authentically embracing and practicing AHIMSA. That being said, however, my yearning for my former favorite food group (cheese) had gone completely unsated…that is, until now.Thanks to the brillance of Miyoko Schinner and her recently-published cookbook, “Artisan Vegan Cheese”, my quest is over. Fresh mozzarella—success! Here’s my first creation….spaghetti topped with black truffle pate and mozzarella. So yummy! Pizza dough resting now in readiness for margarita pizza, using my mother’s homemade gravy (some might call it ‘tomato sauce’) and the mozzarella. The pizza dough was made with double zero farina imported from Italy. The bag is completely written in Italian. Must get some fresh basil to adorn, what I am sure will be, this anticipated delight! Parmesan cheese is air drying. Yogurt setting in refrigerator in preparation for air dried cheddar and gouda cheeses. A tip for fail-safe fermenting and setting of the yogurt….after warming the milk to 110 degrees and adding the starter yogurt, pour it in a large glass mason jar and screw on the lid. Wrap a heating pad around the jar and secure with rubber bands. Turn the heating pad on. I use the ‘high’ setting on mine, but I guess that would depend on how hot your heating pad gets. Besides keeping the yogurt warm, it creates the dark place that is needed. Perfect environment to culture your yogurt. After 8-9 hours, remove the heating pad, and simply place the jar in the refrigerator. It will continue to set and become firm after several hours. I am beyond ecstatic when I say that I think my vegan years of yearning for an acceptable alternative to dairy cheese has come to pass! 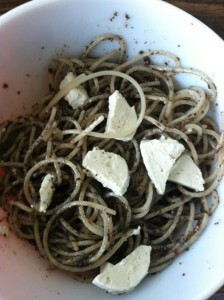 Thank you, Miyoko Schinner and “Artisan Vegan Cheese”! Combine sugar, oil, and yeast with 2 cups water in large bowl or standing mixer or food processor. Allow to sit for approximately 10 minutes, until the yeast becomes foamy on top. Mix the farina and salt together in another bowl. If using mixer or food processor, turn on and then slowly add the flour/salt mixture. Process until a smooth dough forms, which should take another 8-10 minutes. I much prefer using my hands for this step, so if you choose to do it the ‘old-fashioned’ way, as I do, mix the ingredients together until not quite all mixed, then turn out onto board (granite works best, but a clean dry surface with just a slight dusting of flour will also suffice), and knead to your heart’s content. 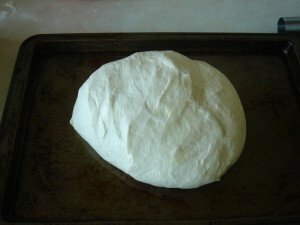 It may take longer than 8-10 minutes, and at first the dough will stick to your hands…but trust me, suddenly the dough will break loose of your skin and you will have this lovely, pliable mound of dough working between your hands. As Julia Child once said, and I am paraphrasing…don’t be shy, beat it up, slap it onto the counter, work the gluten. Trust me, it not only won’t hurt your dough, it will reward you later. Put the dough on a greased cookie sheet, cover with plastic wrap, and let sit at room temperature for one hour. After the hour, cut the dough into four, and roll into four balls. Place the dough balls in a greased 9×13 pan, brush the dough balls with olive oil, cover with plastic wrap, and allow to rest in the refrigerator for 2 days. Yes, I did say 2 days. Again, you will be rewarded for your patience with this step. Wow!!! Wonderful, enthusiasic & imformative article Linda! Thank you for sharing your knowledge in Veganification.